Over the past Fourth of July weekend, we hosted a BBQ featuring smoked brisket and various side dishes like cole slaw, corn on the cob, among others. 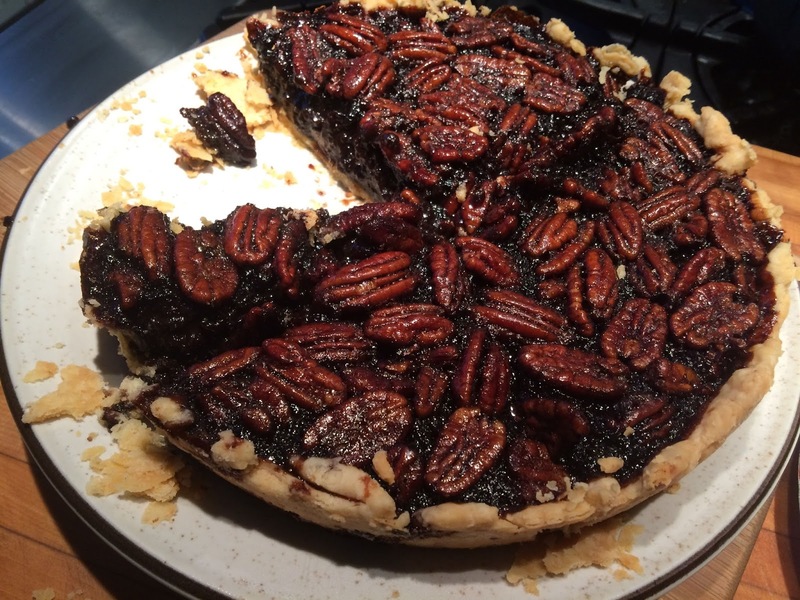 The feast also presented me with the opportunity to make something I'd been thinking about for a while now - pecan pie. 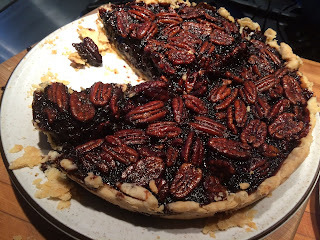 Among the multitude of pecan pie recipes, I decided to go with one from John Besh, a well-known chef from New Orleans whose tv shows had always impressed me. I figured anything he published was likely to get me into the right direction and the results proved me right. Place a rack in the middle of the oven and preheat the oven to 350°. Put the molasses, brown sugar, corn syrup, butter, and salt into a medium saucepan over moderate heat. Stir with a wooden spoon until the butter has melted and the sugar has dissolved. Increase the heat to high and let the mixture boil for one minute. Remove from heat, then pour into a mixing bowl and set aside to let cool to room temperature. Whisk the eggs, vanilla, and bourbon into the molasses. Stir in the pecans, then pour into the prepared pie crust. Bake until the pie is set around the sides and nearly set in the middle (it shouldn't wobble when you give it a nudge), about 1 hour. The color should be mahogany and the crust golden. Allow to cool completely before serving. Whisk together the flour, sugar, and salt in a large bowl. Using a pastry cutter or 2 knives, cut the butter and lard into the flour until it resembles cornmeal. Sprinkle in ice water, only as needed, mixing it into the dough until it comes together into a ball. Press the dough into a round, flat disk, then wrap it in plastic wrap. Refrigerate for 30 minutes before rolling it out. Liberally coat a 9–10 inch pie pan with softened butter, then dust with flour. Roll out the dough on a floured surface to a thickness of 1/4 inch. Wrap the dough around the rolling pin, then gently fit the dough into the pan. Trim off overhanging dough and crimp the edges. For the flaky crust, I use a mix of leaf lard and butter as the combination imparts a texture that butter alone can't really do. I've only learned about it recently but since I have a reliable local source and it adds so much to crusts, I'm completely hooked on it. It's not shortening and it's not regular lard. It comes from the kidneys of the pig and doesn't have a 'porky' flavor. Make sure not to handle the dough too much, you want to avoid building up the gluten which can make it something close to cement. Once you've added the ice water, stop. You can roll it out in advance, then wrap it and store it in the freezer for a couple of days, if you wish. Or make the dough ahead, shape it into a disk, cover it with plastic wrap, and refrigerate it for a few hours before you need it.